Clean and cut crabs into pieces. Soak tamarind in 1/2 cup water and keep it aside. Heat a pan, add grated coconut along with shallots and curry leaves and dry roast till brown. Switch off and add coriander powder and garam masala and mix well. Grind it to a fine paste adding little water and keep it aside. In a clay pot or pan, add tomato, green chillies, ginger chopped, chilly powder, turmeric powder and tamarind extract or water. Add cleaned crab pieces and salt, mix well and cook on medium flame for about 6-8 minutes. Add ground coconut mixture and 1 1/2 cup water and mix well. Check salt and allow it to boil. Cook it for about 5 minutes on medium flame or till the gravy thickens. Remove from flame. Looks yummy.. never cooked crab at home..
Luce muy tentador todo con curry me encanta,abrazos hugs,hugs. 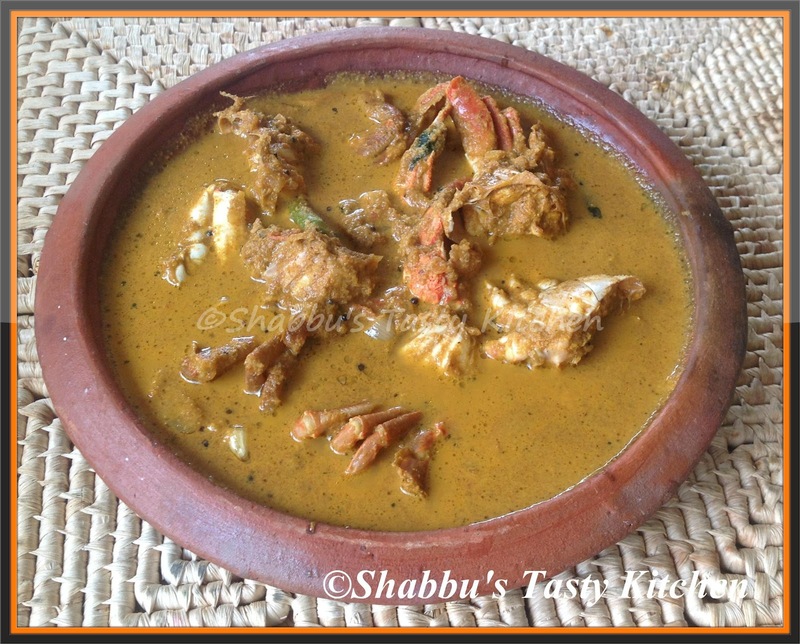 Yummy and delectable crab curry dear.